ChatSim, the unlimited free chat service, is is coming to DirectD for RM64.90. This price includes a one year subscription to the service, although it does not cover the costs of additional credits for sending pictures or other media. The local retailer expects the stock to arrive in 5 weeks, and has already opened the pre-order. It had been reported earlier that DirectD would be the official retailer for ChatSim, and this latest announcement only reveals the entry pricing for the service. It should be noted that while buying the SIM card can now be done in RM, it appears that maintaining the subscription must still be done in Euro through the official website. 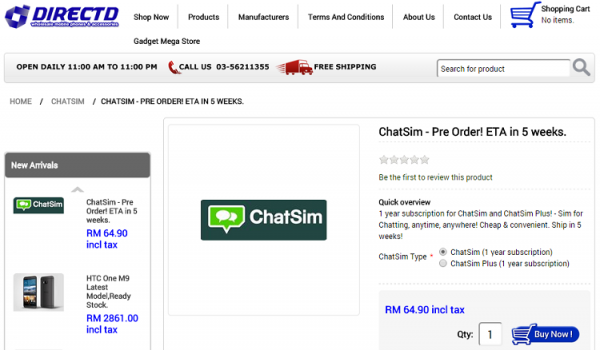 ChatSim was originally available for the low price of €10 (about RM40) from the website, although that does not include the €5 (about RM30) fee for the SIM card itself or shipping which amounts to €11 (about RM44). Considering the numerous fees involved, this is a substantial discount over ordering the SIM card online. However, the yearly subscription fee for ChatSim remains at €10; and DirectD does not appear to be offering recharge packs either. We’ve covered the details of what ChatSim entails back when it was still called WhatSim; the service has remained the same since then, despite the difference in name. Locals who are interested in getting unlimited roaming data for chats can visit DirectD’s online store.